Here’s a great group of turtle pictures to help with identification for all the types of turtles in the family Emydidae. 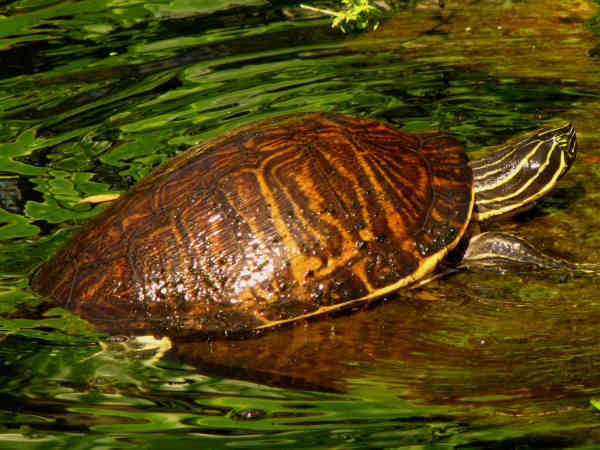 They are better known by their common names such as box turtles, cooters, pond turtles, sliders and more. Adapted to water habitats describes most of the species. Cooters are more often than not adapted to rivers. Pond turtles and sliders adapt to the slow moving waters of ponds. Most people with only a passing knowledge of turtles quickly identify the local box turtles as a terrestrial group. Most species also get collectively referred to as basking turtles. It’s practically impossible to miss their basking behavior on logs and stones adjacent to their water habitats. As reptiles, they need the sun to regulate their body temperature. As turtle research continues, the taxonomy or way turtles get classified changes. Currently the family splits into eleven different genera and close to forty species. It ranks as the largest and most diverse family of turtles in the United States. Geography determines the ranges for most fresh water species. States along the West Coast have only two native species. The Painted Turtle (Chrysemys picta) in the top picture bucks the general trend. 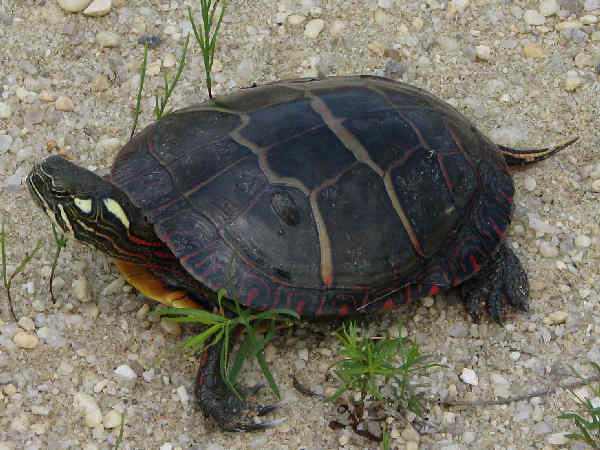 Four Painted Turtle subspecies have been documented, including a western species. It is the most wide ranging of all the fresh water turtles in the United States. Depending on the subspecies, they have more or less red markings on their shells and bodies. They are so popular that four states, Michigan, Illinois, Vermont and Colorado call them their official state reptile. All turtle identification guides emphasize the fact that shell patterns along with colorful facial and neck patterns make for good field identification clues, especially in areas with above average turtle diversity. 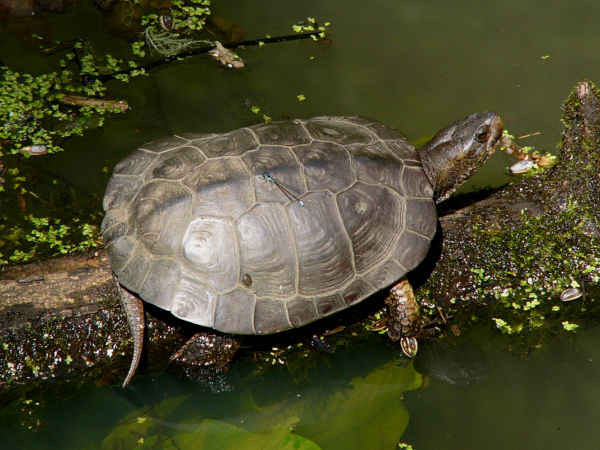 This section provides pictures and general information covering species from most of the fresh water turtle genera. This section of turtle pictures provides a quick overview of the remaining genera of pond and basking turtles. 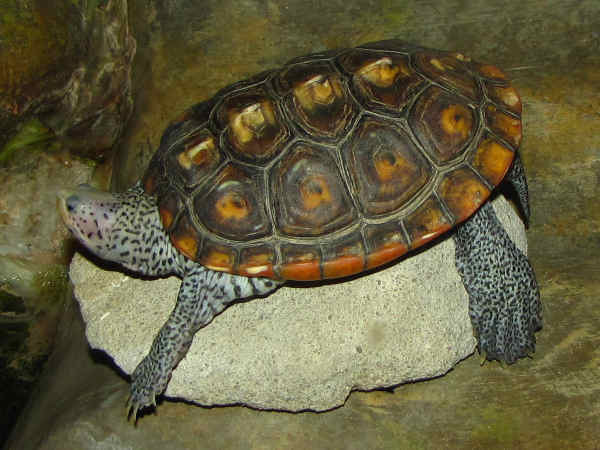 Seven different Diamondback Terrapin subspecies (Malaclemys terrapin) represent the Emydidae family, although they present a variation on the Emydidae freshwater preference theme by inhabiting transition zones between the freshwater rivers and salt water oceans of the East Coast and Gulf of Mexico. Although none of the subspecies grows larger than a foot in length, their shell appearance differs from location to location. Additionally, all of the subspecies share the physical characteristic of having a white face with dark markings. Western Pond Turtles (A. marmorata) are the rare West Coast species. There use to be one species that inhabited rivers and ponds up and down the West Coast. It has subsequently been split into two species. It is listed as endangered in Washington State, with habitat loss cited as a causal factor. 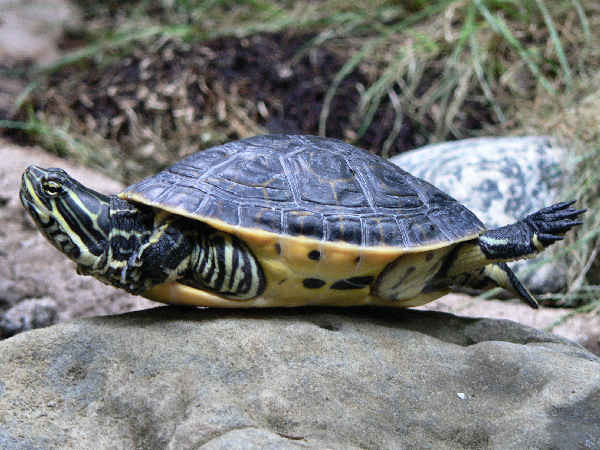 The yellow-bellied slider, (Trachemys scripta scripta), a relative of the more common Red-headed Slider, inhabits slow moving water bodies like ponds and lakes of the South. Cooters are the larger than average river turtles common in many areas of the eastern United States. The Peninsula Cooter (Pseudemys peninsularis), also known as the Florida River Cooter, lives in slow flowing rivers and streams from Virginia, south through Florida. They feed primarily of local plant life. The picture shows a specimen with a colorful green and yellow patterned shell. 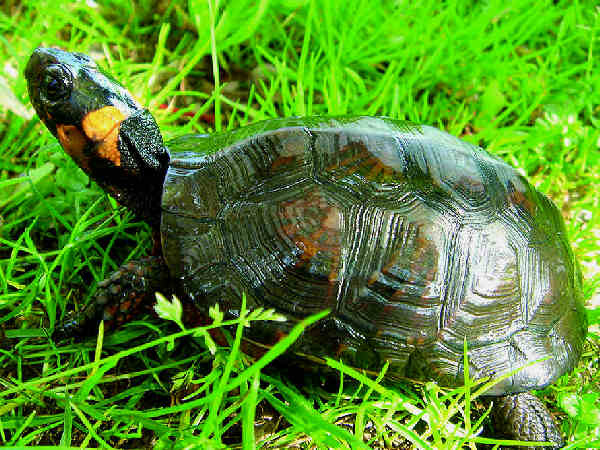 Size along with a patch of yellow or orange color on the side of the neck represent the basic field identification clues for the Bog turtle. They measure less than five inches in length. They live year round in their locations and tend to hibernate for approximately half the year. Eastern Chicken Turtle (Deirochelys reticulara) are common in the Southeast. The picture shows many of the elements necessary for turtle identification. Of species note, the underside portion of the shell shows some dark spots. That is common in many but not all chicken turtles. They also have a plain plastron. Blanding’s Turtle (Chtysemys picta) is a northern species that lives in ponds and streams in and around the Great Lakes. There are spillover populations into adjacent states. The yellow throat is a good identification clue. Most areas of the northern United States have only a few species so it is fairly easy to identify. Fourteen species of Map Turtles (Graptemys) can be found in the Eastern United States. 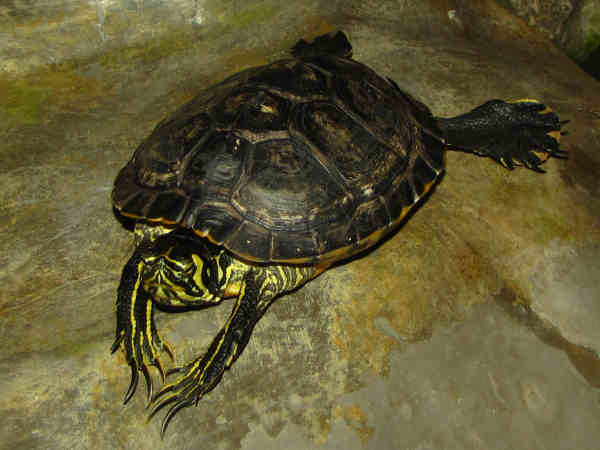 The yellow markings on the face and legs often gives them a physical look similar to other water turtles. The ridge down the center of the carapace is the best way to picture them out in the pond as they are basking in the sun. The Common Map Turtle in the picture is probably the most widespread of all the species. It ranges from the Great Lakes area to the northern areas of the Gulf Coast States. 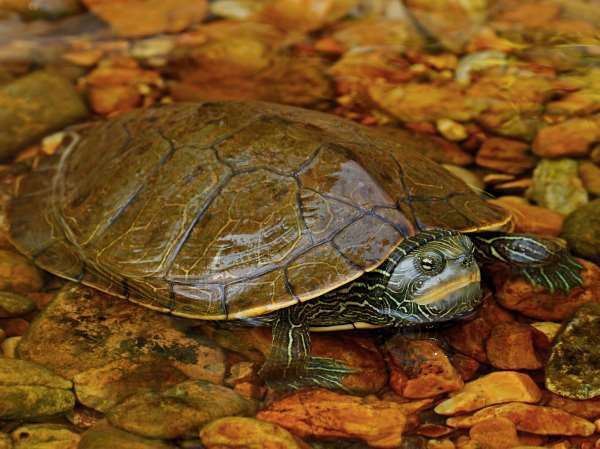 Many of the other Map Turtle species have a range limited to one river system or watershed. Because of their limited range, many of them are listed as threatened or endangered in states. 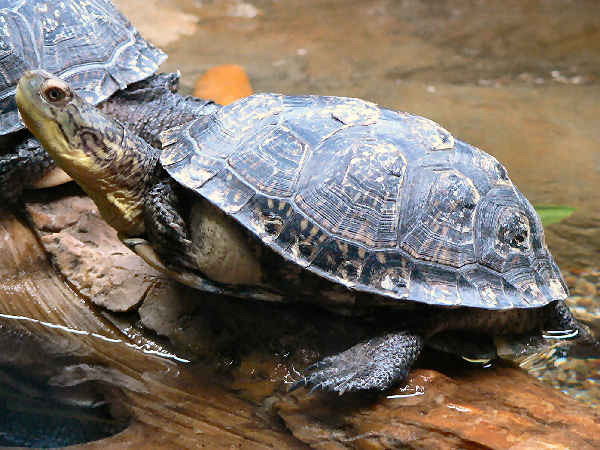 Two species, the Ringed Map Turtle and Yellow-blotched Map Turtle are listed as threatened under the Endangered Species Act. 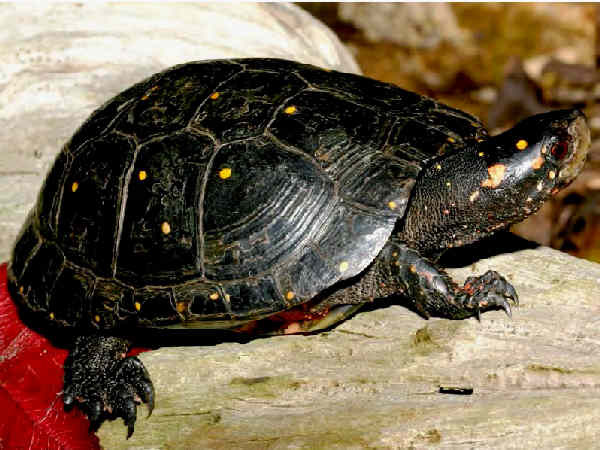 Spotted Turtles inhabit shallow waters along both the East Coast and the Great Lakes. They grow to only five inches in length and the spots on the shell make for easy identification. For turtle fans, seeing one is a more difficult task than identifying one. They are listed as threatened or endangered in most states due to habitat loss.